The European Aviation Network is complete and ready to fly. Partners Inmarsat, Deutsche Telekom and Nokia announced this week that the 300+ tower ground component is fully deployed and the integration testing is complete. The companies also indicated that the first commercial aircraft installations are underway. Completion of the ground component represents the final major infrastructure milestone in the EAN build out. While some potential legal challenges to the service remain – Eutelsat and Viasat are among those opposing the network architecture, particularly the heavy use of the ground component in the service delivery – EAN is expected to enter commercial service in the first half of 2018. One of the greatest benefits that EAN brings to the market is also a potential liability for the service. Nearly all of the performance spec’s make it clear that Inmarsat plans for most of the data to traverse the Telekom LTE network, not the satellite service. Inmarsat promises 75 Mbit/second of throughput to each aircraft and sub-100ms latency. Whenever the system switches to the S-band satellite the latency will jump (~600ms minimum for geosynchronous orbit) and the total capacity in the system will drop. The heavy dependence on the ground components brought about the protests from other vendors and ultimately the lawsuits. Scheduling of an appeal over the issuance of license to operate in the UK is now in progress. 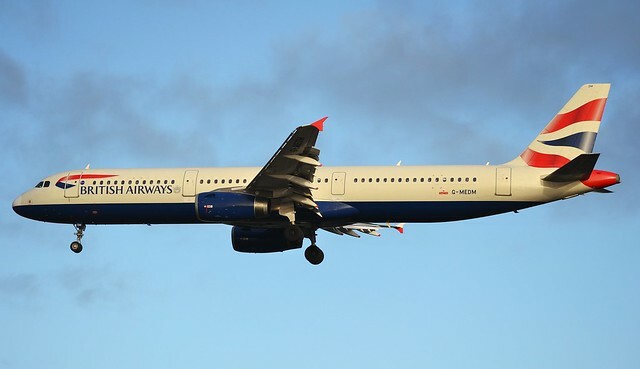 One of the first aircraft with at least some of the kit installed is G-MEDM, a British Airways A321. The aircraft was out of service for a couple weeks in November 2017 and emerged from the shop with the two tiny ATG LTE antennae mounted on the bottom of the fuselage. They’re nearly impossible to spot, but they are definitely there. Zooming in tight on the forward section of G-MEDM shows one of the EAN LTE antennae installed. The aft section of G-MEDM shows one of the EAN LTE antennae installed. It is unclear if the similarly small S-Band satellite antenna is also installed on top of the fuselage; the photos of MEDM are unclear on that front, but initial indications suggest they are not present or incredibly small.